Yes, I said hexagon. If you haven’t heard, our solar system’s second-largest planet has another curious feature besides its sprawling rings; it’s also in possession of an uncannily geometric six-sided jet stream encircling its north pole — at the heart of which lies a churning hurricane-like vortex over 1,800 miles wide. This hexagon has been known about since the days of Voyager, and now NASA’s Cassini spacecraft has presented us with the highest-resolution look yet at this odd atmospheric phenomenon. 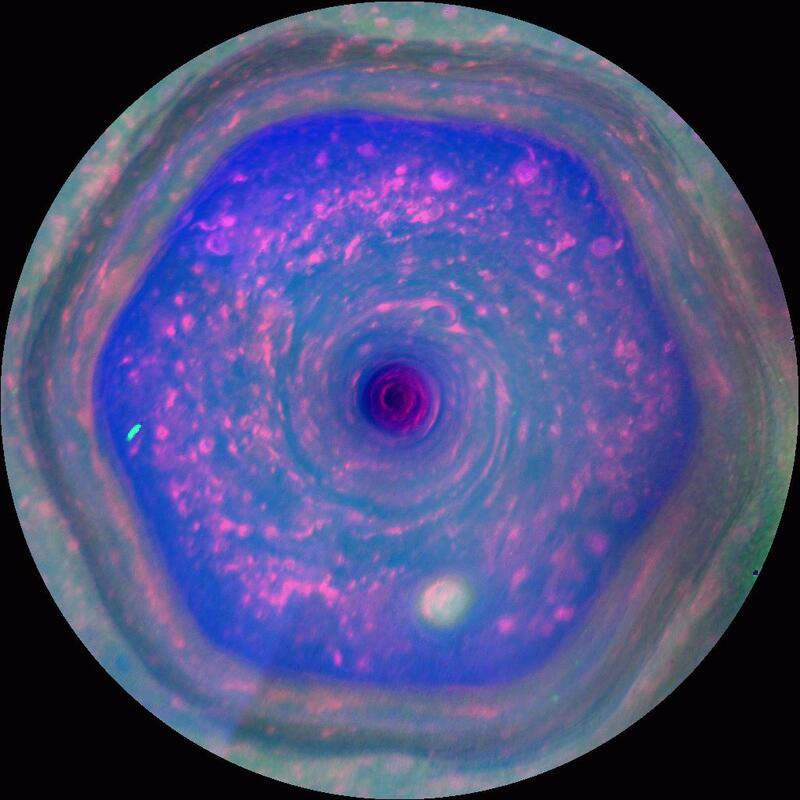 This colorful view from NASA’s Cassini mission is the highest-resolution view of the unique six-sided jet stream at Saturn’s north pole known as “the hexagon.” This movie, made from eight images obtained by Cassini’s imaging cameras over 10 hours on Dec. 10, 2012, is the first to show the hexagon in color filters and the first movie to show a complete view from the north pole down to about 70 degrees north latitude. Click to play the animation full-size. Scientists can see the motion of a wide variety of cloud structures that reside within the hexagon in this movie. There is a massive hurricane tightly centered on the north pole, with an eye about 50 times larger than the average hurricane eye on Earth. Numerous small vortices are also present, which appear as reddish ovals. Some of these vortices spin clockwise while the hexagon and hurricane spin counterclockwise. Some of those smaller features are swept along with the jet stream of the hexagon, as if on a racetrack. The biggest of these vortices, seen near the lower right corner of the hexagon and appearing whitish, spans about 2,200 miles (3,500 kilometers), approximately twice the size of the largest hurricane on Earth. The differences in this version of the movie, in which different wavelengths of light from ultraviolet to visible to infrared have been assigned colors, show a distinct contrast between the types of atmospheric particles inside and outside the hexagon. Inside the hexagon there are fewer large haze particles and a concentration of small haze particles, while outside the hexagon, the opposite is true. The jet stream that makes up the hexagon seems to act like a barrier, which results in something like the “ozone hole” in the Antarctic. 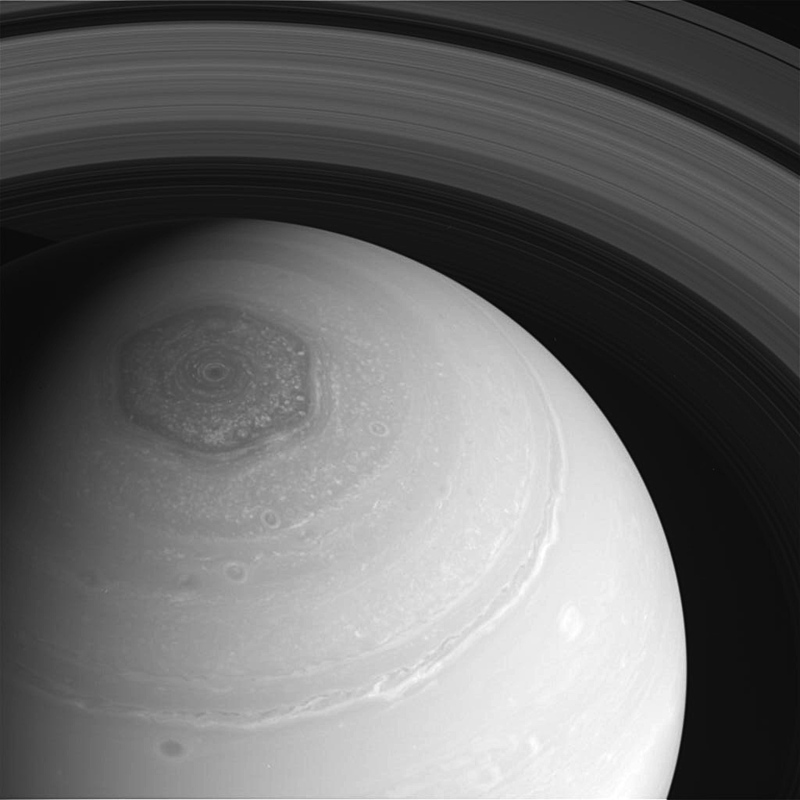 High-resolution views of the hexagon have only recently become possible because of the changing of the seasons at Saturn and changes in the Cassini spacecraft’s orbit. The north pole was dark when Cassini first arrived in July 2004. The sun really only began to illuminate the entire interior of the hexagon in August 2009, with the start of northern spring. In late 2012, Cassini began making swings over Saturn’s poles, giving it better views of the hexagon. Previous Post So… What’s Up With ISON?